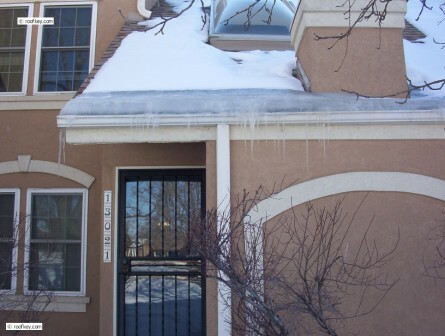 Denver Area as well as in many other areas of the U.S. Where there is snow accumulating on the roof and temperatures falling below freezing for a period of time, there generally is ice damming along the eaves. If there are ice cycles there is roof ice damming. 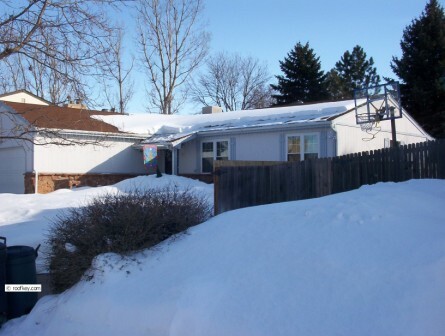 The snow on the roof melts slowly, usually from a combination of heat loss from the house through the underside of the roof decking and from the heat of the sun. Small amounts of water start running down and over the surface of the roof until it reaches the eaves where it is much colder and freezes. 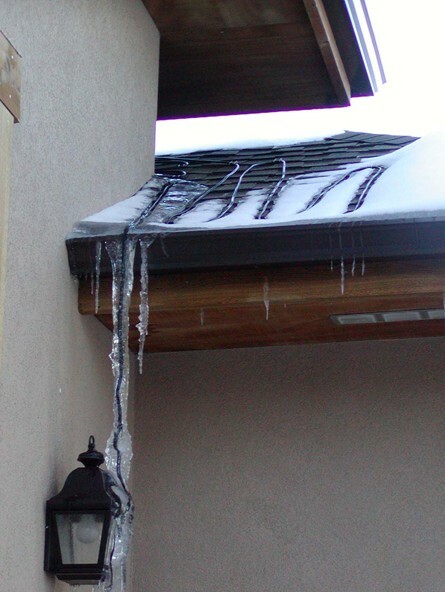 The ice that forms at the eaves is a minor problem itself. The major problem is what it creates - the ice becomes a dam holding water. As water continuously runs down the roof it starts ponding or standing behind this ice dam before it also forms more ice and enlarges the ice dam. This slushy mixture of ice and water before it freezes is the cause of many roof leaks because sloped roofing materials are designed to shed water, not hold water. So the water seeps through the roofing materials and starts soaking the roof decking. Once the water reaches the decking, not only does it start to rot the decking, water finds its way through nail holes and joints in the decking into the soffit areas and sometimes into both exterior and interior walls, even into ceilings and floors. We recently saw lots of Ice Damming along the Colorado Front Range during January and February of 2007. During the winter of 2007 and 2008 we again experienced a month of ice damming during December '07 and January '08. Did you know we have minor ice damming almost every year? Many other years in the past we have had major ice damming. When you have snow on the ground (and roofs) for long periods of time you have major ice damming. 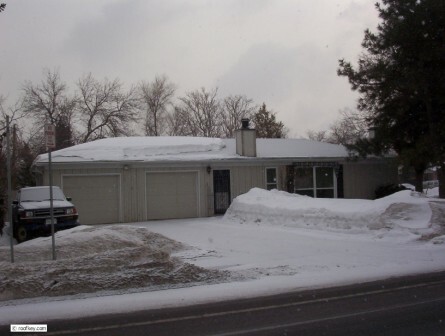 NOAA's National Weather Service lists ten years here in Denver, Colorado where snow was on the ground anywhere from 27 days in January 1989 through February 1989 up to 63 days in November 1983 through January 1984. Five of the other record breaking years were in the 1970's, 1980's, 1990's, and of course 2007. So seven of the ten record breaking years for Denver's consecutive days of snow cover were recent. Did you know that some City and County Building Departments have not recognized that we have ice damming? 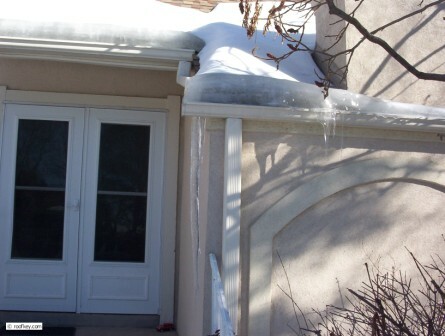 One reason many Building Departments have not been aware of the problem is Building Permits are rarely ever taken out to repair the damage caused by ice dams. 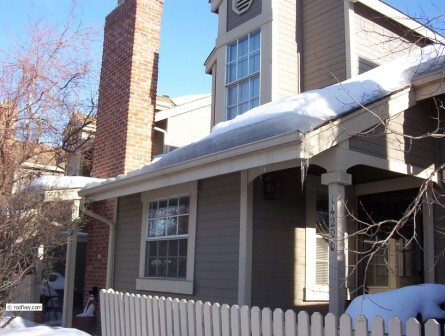 Many Roofing Contractors also mistakenly believe we don't have ice damming problems here along the Front Range. But most Roofing Contractors when replacing a roof leave the existing underlayments in place and never look at the roof decking at the eaves unless their foot falls through it because it has rotted. Many Building Departments have now changed because of the new wording that first appeared in both the 2006 IBC and IRC and has been continued in the 2012 IRC and IBC which reads "In areas where there has been a history of ice forming along the eaves causing a backup of water an ice barrier that consists of...shall be used in lieu of normal underlayment and extend...". The keywords are "history" and "ice forming along the eaves". As indicated by the National Weather Service information listed above, we have major snow cover forming ice along eaves frequently. This occurs more frequently than other building design criteria such as maximum snow loads per square foot, 1 hour rainfall, and miles per hour 3-second wind gusts. Many Roofing Contractors bid and install roofs only to code, never letting the roofing consumer know that there are many roofing guidelines that can be implemented to greatly reduce the chance of roof leaks and other roofing problems not to mention callbacks and litigation. (See roofkey Roofing Guidelines web page.) 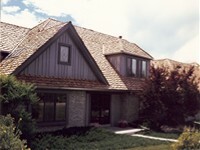 Just because a City/County does not require a particular roofing guideline does not make them right. When a problem does occur fingers start pointing. "I roofed it to the Local Building Code." "It's not my problem." Just following the Local Building Code has gotten many Roofing Contractors into trouble in the past resulting in litigation where the courts have ruled against them. The solution to preventing damage from ice damming is very simple. Install an Ice and Water Membrane on the decking at all eaves and up the roof slope 2 feet past the exterior wall for all sloped roofs. Yes, it adds a little more cost to the installation of a new roof but it reduces the risk of having roof leaks due to ice damming to almost zero. Installing heat tape at the eaves helps somewhat but as you can see from some photo below ice will still form even with the use of heat tape. 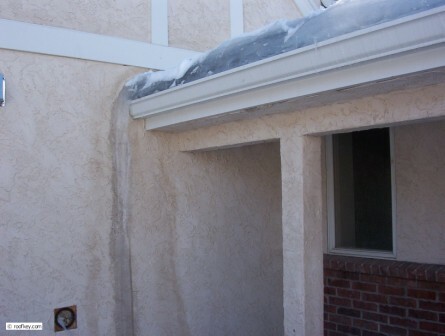 The damage I have seen during the 2007 winter and previous years caused by ice damming ranges from minor water damage to the fascia, which can easily be repainted, to major damage where in one case the soffits, walls, ceilings, and floors had to be replaced to the tune of more than $20,000.00. Insurance companies do not sort property damage from winter storms into separate categories such as damage from ice damming, roofs collapsing due to snow load, snow blowing in air vents, etc. They do acknowledge that over the years they have received many claims for damage caused by ice damming. 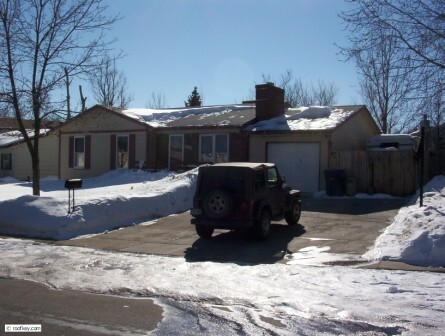 Most insurance companies do not pay for the damage caused by Ice Damming unless the roof was also damaged. The cost of repairs usually falls on the property owner. and City Council know that there is a problem with ice damming. The following are photos I took of ice damming that occurred in the Aurora and Littleton, Colorado areas. Some of the photos are of roof slopes facing east and west and of course north. The last three photos are of roofs where the snow and ice was shoveled off to mitigate the damage being caused by ice damming. The same type photos could have been taken in any city along the entire Colorado Front Range during January and February 2007. If you have any photos and/or stories you would like to share about damage to property caused by ice damming please send an e-mail to solutions@roofkey.com.